For thousands of years, humans have taken a masochistic pleasure from adding chilli to their food. Now research indicates that the spice that has undoubtedly made our lives more interesting may also make them longer. There is only one mammal that enthusiastically eats chillies. "Humans come into the Western hemisphere about 20,000 years ago," says Paul Bosland from New Mexico State University. "And they come into contact with a plant that gives them pain - it hurts them. Yet five separate times, chilli peppers were domesticated in the Western hemisphere because humans found some usefulness - and I think it was their medicinal use." A huge study, published this summer in the British Medical Journal, seemed to indicate that a diet filled with spices - including chillies - was beneficial for health. One of the authors of the study, Lu Qi - who confesses that he is very keen on spicy food - says there are likely to be many reasons for this effect. "The data encourages people to eat more spicy food to improve health and reduce mortality risk at an early age," says Qi, a nutritionist at the Harvard TH Chan School of Public Health, though he adds that spicy food may not be beneficial for those with digestive problems or stomach ulcers. While the health-promoting properties of chillies may not be fully understood, at least we have a good idea where to look to find the source of them. Cut a chilli open and you will see yellow placenta-like fronds that attach the seeds to the inside of the fruit. In most types of chilli, this is the location of the spice's secret weapon - capsaicin. While the Satanic-red horns of chillies seem to hint at their throat-scorching potential, extracted capsaicin is an odourless and colourless substance. Chilli-maniacs can buy phials of the stuff on the internet, though its use as a food additive is banned in the EU. It is used in pepper spray, however. The use of chilli peppers as weapons dates back to pre-Columbian times, when, it's said, Mayans burned rows of them to create a stinging smokescreen. And in what may have been a pre-Columbian version of the naughty step, an ancient Aztec codex shows a parent propelling a teary-eyed infant near a pit of burning chillies. However, the Aztec codices also tell us that they put chilli on their teeth to kill toothache pain, and the use of capsaicin as an analgesic also continues to this day. Joshua Tewksbury, a natural historian at the University of Washington, thinks the burning sensation we experience when we come into contact with chillies is an evolutionary trick. "We're not actually being damaged by the capsaicin the way we would be if we were touching a stove, but our brain thinks we are," he says, adding that all mammals experience the same sensation but that birds do not. "They can eat chillies like popcorn and they don't feel the heat." In this way, Tewksbury suggests, the plant evolved to repel animals that might crush its seeds with their molars, but not ones that would help disperse them. 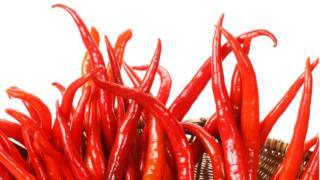 More importantly for humans, chillies also evolved to repel microbes. This was of great value in the days before medicine and refrigeration, when, particularly in the tropics, people were vulnerable to bacteria that could harm them directly or cause their food to spoil. Chillies kill or inhibit 75% of such pathogens. That may just explain the spice's world-conquering success. Just two or three years after Columbus brought capsicum seeds back from the New World in 1493, Portuguese merchants took the plants to Asia, where they would transform the cuisine. This correlation with climate, and the attendant risk of infectious disease, was greater than the link with the right growing conditions for the spices. In other words, humans in dangerous climates developed a taste for chilli which, as Joshua Tewksbury puts it, "probably saved them a lot of death". But what about heart disease and cancer? The recent study in China found a correlation between the consumption of spicy food and lower rates of death from those diseases - and laboratory research from the last 10 years suggests some possible reasons for that too. In 2012, a team of nutritionists at the Chinese University of Hong Kong, working with hamsters, found that capsaicin helped break down so-called "bad" cholesterol which might have clogged up the animals' arteries, but it left alone the "good" cholesterol which helps remove it. There was a second benefit for cardiac health too - the capsaicin appeared to block the action of a gene that makes arteries contract, restricting blood flow. "There are a lot of reports that say that capsaicin may be good for human health, especially with cancer," says Zigang Dong at the Hormel Institute of the University of Minnesota. "However, there are other reports that show totally the opposite result." Dong is the co-author of a 2011 review, published in the journal Cancer Research, titled The Two Faces of Capsaicin, in which claims about the spice's benefits for health are laid alongside a long list of counter-claims, pointing to negative effects. "Probably it is harmful in the stomach or oesophagus because capsaicin itself can cause inflammation," says Dong. "And if anything can cause inflammation or so-called burning effect, it must cause some cell deaths and therefore the long-term chronic inflammation is maybe harmful." Far from seeing the chilli's piquancy as an evolutionary "trick" that we are clever enough to see through, as Joshua Tewksbury does, he sees it as a hint to eat the food in moderation - a hint that many of us are ignoring. Capsaicin - and the chilli pepper - remains enigmatic. But whether it is a friend or foe, we're exposing ourselves to it more and more. Between 1991 and 2011, global consumption of dry chillies increased by 2.5% per year, while our per capita intake increased by 130% in that time. "There's a worldwide huge consumption of this spice, or vegetable, or whatever you want to call it," says Dong. "It's consumed everywhere in the world. Therefore its impact is huge for human health." Capsaicin creams and patches are available in chemists to ease pain. But it's only in the past 20 years that we have come to understand the contradiction of how something that causes pain can ease it too. Capsaicin binds to the pain receptor TRPV1, which our brains also use to detect changes in temperature - that's why we think chillies are hot. But after being over-stimulated the neurons stop responding, killing the pain. This process involves the release of endorphins, which can give us a "rush" not dissimilar from the feeling of having exercised well. This may explain why some people believe that hot food is addictive. Lu Qi spoke to Health Check on the BBC World Service. Joshua Tewksbury spoke on The Why Factor: How Chillies Became Hot.